An analysis of predicted fire impact, together with social and physical geography, allows the planning team to develop a risk management response to best suit the characteristics of a community. Community protection planning is working with communities, stakeholders, and partner agencies in the development and implementation of risk management strategies, including Protection Plans, Response Plans, and Mitigation Plans. Click below to watch videos on Bushfire Risk and Protection Planning. 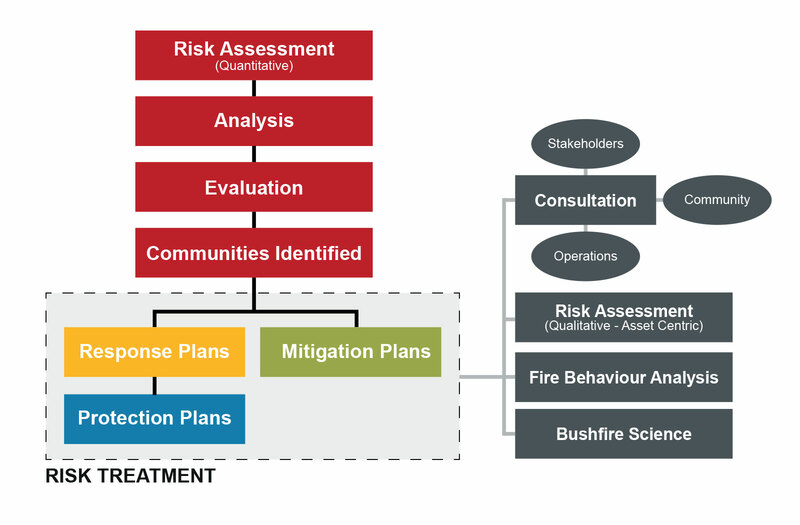 The bushfire risk identification and analysis process used in Community Protection Planning is guided by the National Emergency Risk Assessment Guidelines (NERAG). The risk management framework developed by Community Planning conforms to international standards for risk management ISO 31000. A key component of the Community Bushfire Protection Planning process is the identification of nearby safer places. A nearby safer place is a site that provides a shelter option for people, as a last resort. Last Updated - Thu Apr 11 22:57:01 AEST 2019.